The Rose Bowl hosts soccer on a beautiful Pasadena evening. Photo courtesy of World Soccer Talk. The US-Canada-Mexico 2026 World Cup bid appears to be the favorite, even with no other nations to bid yet. Thanks to the impressive and expansive infrastructure in the three nations, hosting a World Cup would not be a problem. However, travel and choosing the stadiums could become difficult. Let’s focus on that second problem. With the US hosting 60 matches and Canada and Mexico hosting 10 each, we can already try and predict potential venues for the most watched sporting tournament in the world. 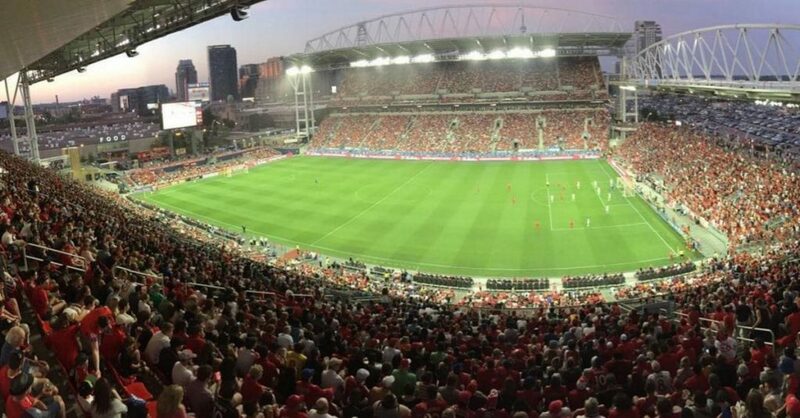 Canada soccer has recently improved their game stadium-wise. Recent renovations to Toronto FC’s BMO Field have made it one of the most visually appealing soccer stadiums in North America. Another impressive stadium in the northern-most CONCACAF nation is Vancouver’s BC Place. The intricate roof design as well as the ability to expand capacity to 54,500 makes it another quality candidate to host a match or two. BMO Field during a Toronto FC match. Photo by Digital Journal. Montreal also becomes a candidate as new money could build the city’s club team, Impact Montreal, a new stadium. 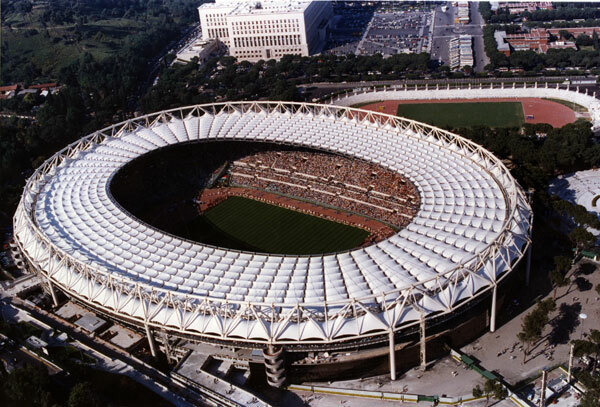 Olympic Stadium would likely not be a candidate due to its old and not-totally-soccer friendly design. With 10 total matches, it can be expected that Canada will offer roughly 3 stadiums to play in. All the cities above proved they can host a World Cup, as evident in 2015 with the women’s version of the tournament. 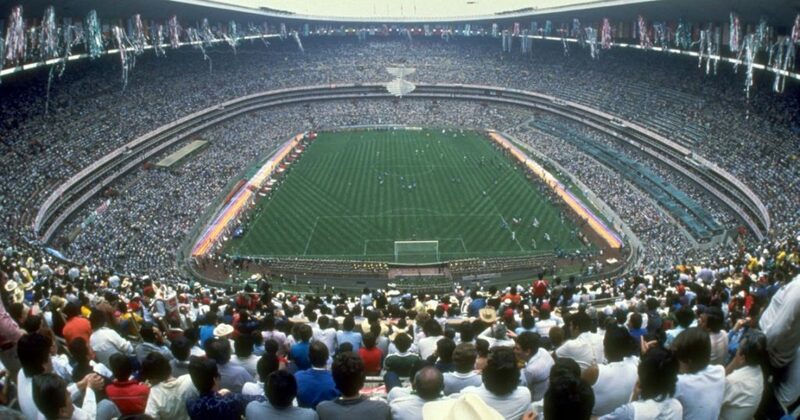 Estadio Azteca hosted some of the World Cup’s greatest memories such as Maradona’s “Hand of God” goal in 1986. Photo courtesy of Remezcla. 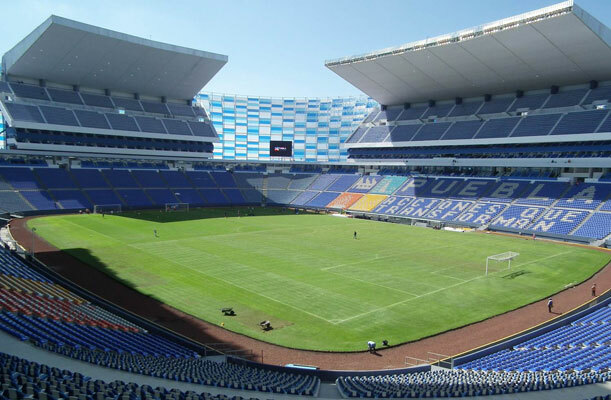 Mexico, like Canada, has added some new sparkling stadiums recently. Having hosted two World Cup’s prior, the country is poised to have the perfect venues. Stadiums like Estadio Cuauhtémoc, Estadio BBVA Bancomer and Estadio Chivas offer state-of-the-art viewing experiences while also being some of the most scenic stadiums this World Cup will have to offer. After undergoing recent renovations, Estadio Cuauhtémoc looks like a perfect candidate to host a third round of World Cup matches come 2026. There will be some questions regarding fan safety in Mexico, much like there was in Brazil. It can be expected, however, that everything will be in check for their 10 games. Now to the bulk of the competition. Hosting 60 matches could be a problem for any other nation but thanks to the United States’ immense sporting background its a matter of picking one rather than creating one. The US is peculiar in the sense it will have to choose between mostly American football stadiums. With the largest soccer specific stadium sitting at a capacity of roughly 27,000 (with the potential to expand to around 40,000), the most likely candidates are those college and NFL football stadiums. This isn’t necessarily a problem, especially when considering many of these stadiums are frequently used for soccer, it just becomes a matter of how smoothly a World Cup match can be ran in said stadium. 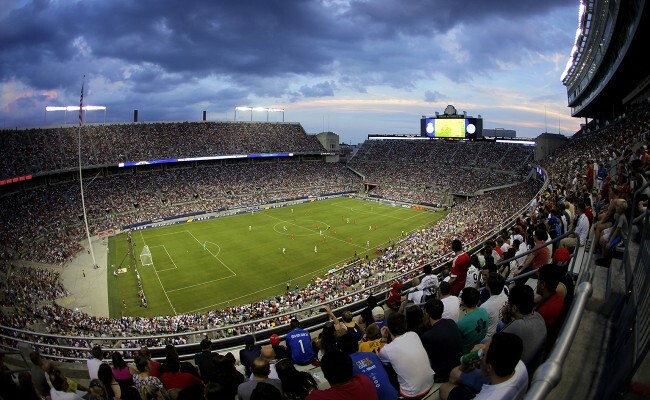 Ohio Stadium in Columbus holds a capacity crowd of 105,000 for a PSG-Real Madrid friendly. Photo by Brian Hendricks, Columbus Underground. The 1994 World Cup had nine venues in eight states, a number sufficient for the 24 teams and 52 matches that were played. 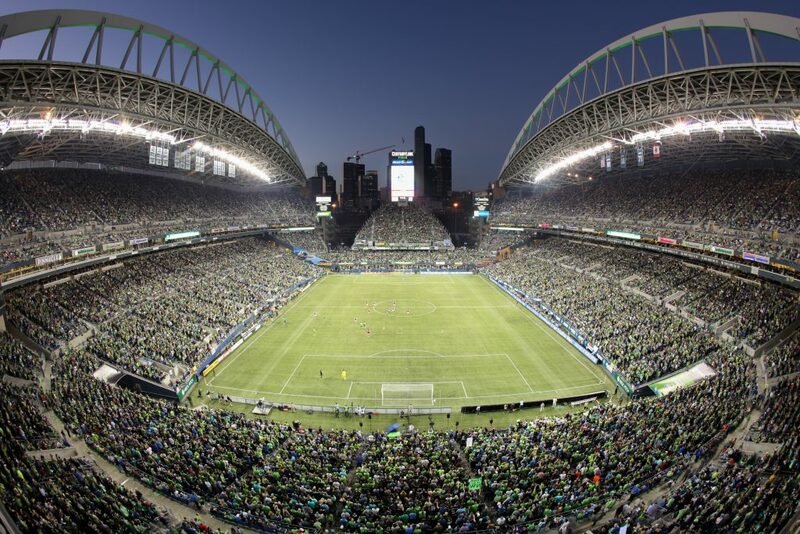 With 60 matches be hosted, it can be guessed that the US will choose around 10 or 11 different stadiums to host them. Some being the whopping 100,000+ seaters, while others will sit around 30-40,000 for some of the lower-profile games. Stadiums that were used in 1994 that can be expected to make a reappearance 32 years later include the likes of the Rose Bowl, Soldier Field and the Meadowlands. All but one of those stadiums have been completely rebuilt, but the “grandaddy of them all” could get quite the face-lift (but we’ll get to that in a bit). There won’t be the need to build brand new stadiums as had been the case with previous World Cups. This will be key to the selection process. The biggest problem, in fact, will be narrowing down the candidates. Cities will be eager to get a piece of the pie; a good problem to have. With a more expansive field, the World Cup can touch virtually every region of the country: both coasts, the Midwest, the Rocky Mountain region and the South. The US will host all matches from the quarterfinals onward, therefore, the final will most likely be somewhere on the coasts. In 1994, the final was hosted at the Rose Bowl; a venue where many other matches through the tournament were played. With an influx of money from FIFA, the historic stadium could get a nice face-lift. Imagine a partial roof surrounding the top of the 92,000 seater bowl blocking out the hot California sun. An updated Rose Bowl could look similar to modern-day Stadio Olympic in Rome. The Rose Bowl will be 104 years old in 2026. 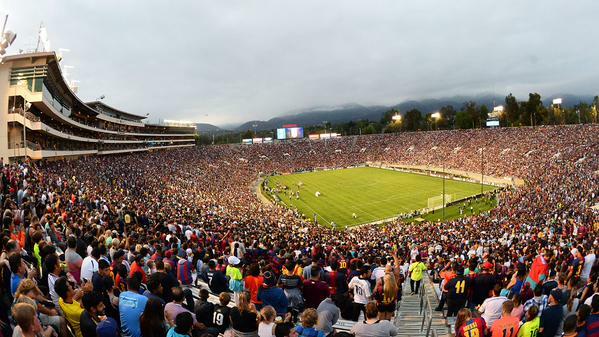 The Rose Bowl’s history, field size, capacity, location and potential for improvement make it a perfect candidate to host the 2026 World Cup Final. It would also be expected that the stadium would host the US’s opening match, as well as some other elimination-round match ups. We’re still a long way from the selection process for stadiums but many of these can be considered candidates when the time comes.